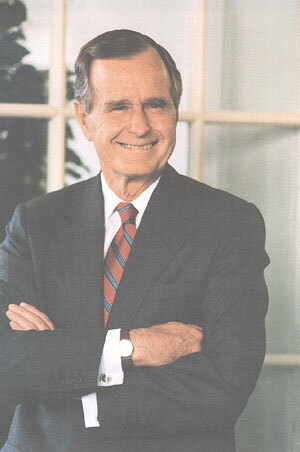 George Herbert Walker Bush, the 41st President of the United States, was born on June 12, 1924, in Milton, Massachusetts. He was a student leader at Phillips Academy in Andover and, on his 18th birthday, he enlisted in Navy to become an aviator. After completing the 10-month course, he was commissioned as an ensign in the U.S. Naval Reserve on June 9, 1943, several days before his 19th birthday, which made him the youngest naval aviator to that date. After finishing flight training he was assigned to Torpedo Squadron (VT-51) as photographic officer in September 1943. As part of Air Group 51, his squadron was based on U.S.S. San Jacinto in the spring of 1944. San Jacinto was part of Task Force 58 that participated in operations against Marcus and Wake Islands in May, and then in the Marianas during June. On June 19 the task force triumphed in one of the largest air battles of the war. On his return from the mission Bush's aircraft made a forced water landing. A submarine rescued the young pilot, although the plane was lost as well as the life of his navigator. On July 25 Bush and another pilot received credit for sinking a small cargo ship off Palau. After Bush's promotion to Lieutenant Junior Grade on August 1, San Jacinto commenced operations against the Japanese in the Bonin Islands. On September 2, 1944, Bush piloted one of four aircraft from VT-51 that attacked the Japanese installations on Chichi Jima. For this mission his crew included Radioman Second Class John Delaney and Lieutenant Junior Grade William White, who substituted for Bush's regular gunner. During their attack four TBM Avengers from VT-51 encountered intense antiaircraft fire. While starting the attack, Bush's aircraft was hit and his engine caught on fire. He completed his attack and released the bombs over his target, scoring several damaging hits. With his engine on fire, Bush flew several miles from the island, where he and one other crew member on the TBM Avenger bailed out of the aircraft. However, the other man's parachute did not open, and he fell to his death. It was never determined which man bailed out with Bush. Both Delaney and White were killed in action. While Bush waited four hours in his inflated raft, several fighters circled protectively overhead until he was rescued by the lifeguard submarine U.S.S. Finback. For this action Bush received the Distinguished Flying Cross. During the month he remained on Finback Bush participated in the rescue of other pilots. Bush subsequently returned to San Jacinto in November 1944 and participated in operations in the Philippines. When San Jacinto returned to Guam, the squadron, which had suffered 50 percent casualties of its pilots, was replaced and sent to the United States. Through 1944 he had flown 58 combat missions for which he received the Distinguished Flying Cross, three Air Medals, and the Presidential Unit Citation awarded aboard the San Jacinto. Because of his valuable combat experience, Bush was reassigned to Norfolk Navy Base and put in a training wing for new torpedo pilots. He was later assigned as a naval aviator in a new torpedo squadron, VT-153. With the surrender of Japan, he was honorably discharged in September 1945 and then entered Yale University. In January 1945, Bush married Barbara Pierce (Barbara Bush) with whom he had six children: George Walker Bush, Robin (who died as a child), John (known as Jeb Bush), Neil Mallon Bush, Marvin Bush, and Dorothy. Bush attended Yale University, where he was tapped as a member of the Skull & Bones Society and graduated as a member of Phi Beta Kappa. Following graduation, Bush "embarked on a career in the oil industry of West Texas." "Like his father, Prescott Sheldon Bush, who was elected a Senator from Connecticut in 1952, George became interested in public service and politics. He served two terms as a Representative to Congress from Texas. Twice he ran unsuccessfully for the Senate. Then he was appointed to a series of high-level positions: Ambassador to the United Nations, Chairman of the Republican National Committee, Chief of the U.S. Liaison Office in the People's Republic of China, and Director of the Central Intelligence Agency" from 30 January 1976 (Pres. Ford) to 20 January 1977 (Carter inauguration). "In 1980 Bush campaigned for the Republican nomination for President. He lost, but was chosen as a running mate by Ronald Reagan. As Vice President, Bush had responsibility in several domestic areas, including Federal deregulation and anti-drug programs, and visited scores of foreign countries. In 1988 Bush won the Republican nomination for President and, with Senator Dan Quayle of Indiana as his running mate, he defeated Massachusetts Governor Michael Dukakis in the general election." "Bush faced a dramatically changing world, as the Cold War ended after 40 bitter years, the Communist empire broke up, and the Berlin Wall fell. The Soviet Union ceased to exist; and reformist President Mikhail Gorbachev, whom Bush had supported, resigned. While Bush hailed the march of capitalism, he insisted on restraint in U. S. policy toward the group of new nations." "In other areas of foreign policy, President Bush sent American troops into Panama to overthrow the corrupt regime of General Manuel Noriega, formerly a CIA asset, who was threatening the security of the canal and the Americans living there. Noriega was brought to the United States for trial as a drug trafficker." "Bush's most lucrative opportunity came when Iraqi President Saddam Hussein invaded Kuwait, then threatened to move into Saudi Arabia. Vowing to free Kuwait, Bush rallied the United Nations, the U. S. people, and Congress and sent 425,000 American troops. They were joined by 118,000 troops from allied nations. After weeks of air and missile bombardment, the 100-hour land battle dubbed Desert Storm routed Iraq's million-man army." "Despite unprecedented popularity from this military and diplomatic triumph, Bush was unable to withstand discontent at home from a faltering economy, rising violence in inner cities, and continued high deficit spending. In 1992 he lost his bid for reelection to Democrat William Jefferson Clinton." George H.W. Bush appointed David Kessler as head of the U.S. Food and Drug Administration in 1990. Recipient in 2003 of the mighty prestigious Altschul Award for "enhancing citizen understanding of world affairs." Quotes: Reknowned for such expressions as the intentionally disingenuous: "read my lips - no more taxes"; "a thousand points of light"; and "kinder, gentler nation";; ... more earnestly, "October surprise" and "What we say, goes!" Associated with the Carlyle Group. Implicated in the Iran-Contra Affair. ↑ Council of Advisors, World Food Prize, accessed December 9, 2007. ↑ Directors, Academy of Political Science, accessed April 15, 2008. ↑ Honorary Patrons, Global Leadership Foundation, accessed January 11, 2010. George Herbert Walker Bush in the Wikipedia. Profile: George Walker Bush, CNN. Webster G. Tarpley and Anton Chaitkin, "George Bush: The Unauthorized Biography," Tarpley.net. Murray Waas and Douglas Frantz "Despite Ban, U.S. Arms Are Sold To Pakistan," Los Angeles Times, March 6, 1992. Murray Waas and Douglas Frantz "U.S. Gave Intelligence Information to Iraq Three Months Before Invasion," Los Angeles Times, March 10, 1992. Murray Waas and Douglas Frantz "Bush Tied to `86 Bid To Give Iraq Military Advice," Los Angeles Times, May 7, 1992. Douglas Frantz and Murray Waas,"Bush Officials Defend Prewar Aid to Iraq,"
Jonathan D. Salant, "Bush Ancestor's Bank Seized by Gov't", Associated Press, October 17, 2003. "President Bush's grandfather [Prescott Sheldon Bush] was a director of a bank (Union Banking Corp.) seized by the federal government because of its ties to a German industrialist (Fritz Thyssen) who helped bankroll Adolf Hitler's rise to power, government documents show. ... The new documents were first reported by freelance writer John Buchanan in The New Hampshire Gazette." This page was last edited on 7 May 2015, at 15:16.